Could Gas-Fracking Fuel a NY Gas Boom? Yesterday members of the Tioga County Landowners Coalition (NY) got an e-mail titled “We Have a Deal”. For the past 11 months, landowner group representatives have traveled to Houston, TX. By their count they’ve placed brochures of the group’s offering (135,000+ acres) in the hands of about 84 companies. They’ve had face-to-face meetings with the CEO’s of 11 companies. But no one was interested. As they tell it, the combination of low gas prices and the movement of drilling rigs to “wet gas” areas along the OH/NY border led to a “complete lack of interest from every company we met”. However, the group managed to find one interested operator and, over the past eight weeks, has been "working creatively with a major operator to create opportunity” for the lease-hungry landowners. That opportunity: an unconventional leasing arrangement with eCORP wherein landowners will receive a majority share of the profits earned by a “sharing company” made up of contiguous parcels with their neighbors. Details to come, but the deal will be a “very lucrative financial arrangement” with the upmost attention given to environmental responsibility. The plan, outlined in their press release, is to fracture the shale using liquefied petroleum (LPG) developed by GASFRAC. This will be better than hydro-fracking, says the landowner group, because LPG fracking uses no water and has no waste. So that should translate into reduced truck traffic and a smaller pad footprint. 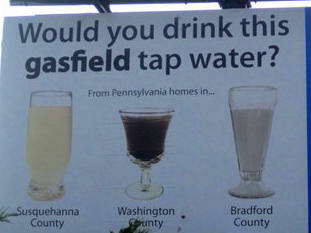 More importantly, this kind of fracking just might get around the state’s moratorium on hydro-fracking. But while the landowner coalition points to Chevron’s reports of successfully gas-fracked wells, Chevron’s own reports indicate that they are still evaluating the process. Using gas to fracture gas wells sounds like a nifty idea, but it’s not risk free. According to Cornell professor Tony Ingraffea, who heads the “fracture” group, gas-fracking still relies on chemicals added to the gelled LPG. The process also needs compressors to re-condense propane/butane that returns from the well for reuse. As for reduction of truck traffic, he notes that LPG has to get to the wellsite somehow, and currently that mode of transport is truck – only instead of hauling water, they’re transporting a hazardous material. And there’s still the problem of what to do with the waste fluids that return to the surface. and there’s the added danger of propane, a heavier-than-air gas leaking and pooling in low spots near the well pad in large amounts and causing an explosion hazard. And fracking with gas is more expensive, initially, though propane can be recovered and used again. Still, the process needs to be “proved”, and according to the local media, that’s what the landowners hope to do – help prove that the process works, and it’s viable for extracting shale gas from the numerous layers beneath Tioga County. Right now the question is whether gas-fracking falls within the rules of the existing environmental impact study for oil and gas drilling. Ingraffea says the science isn’t there to evaluate either the environmental impact or the safety of LPG fracks. Scientists and environmental activists have been warning that the next wars could be about water. Mostly they're projecting a future where, due to climate change and human activity, clean water could be hard to come by. Clean drinking water is already a treasured commodity in some parts of the world, but here in the northeast we have plenty of water - enough to share even. Unless you live in Montrose, PA. Seems that a generous soul has taken it upon himself to put in a water hydrant and pay the local water utility for the water he uses. If he were irrigating corn or filling a swimming pool for the neighbor kids to splash around in, this would probably not be an issue. But the fact that he is filling a water tank and hauling water to Dimock has irritated his neighbors. And the town board. Because, apparently, what you do with your own land is your own business - unless you are offering aid to "those people" in Dimock. His neighbors are referring to him as a "water pirate" and the Dimock folks with no water as "thugs". Which makes one wonder: what would his neighbors do if he drilled a gas well and contaminated their water? Read more here. The emails from the town board are even more interesting, offering rare insight into how elected officials truly feel about those they serve - and the whole concept of "open meeting". That's what Nobel prize-winning chemist F. Sherwood Rowland asked a White House climate change roundtable in 1997. He challenged scientists to speak out on environmental issues. As he said, “If not us, who? If not now, when?” Read more. When a magnitude-4 earthquake hit Youngstown, OH on New Years Day this year, people started asking whether this – and the slew of other quakes hitting their region – was related to nearby injection well. Yesterday officials from the Ohio Department of Natural Resources announced that, yes indeed, about a dozen earthquakes were most likely caused by injections into deep underground waste disposal wells. Wells that accepted waste drilling fluids and injected them into these deep – sometimes 9,000 or so feet – wells. Ohio has about 200 underground injection wells. About 180 of those disposal wells accept waste from oil and gas operations, generating about $1 million for the state. Last year more than half of that waste came from out of state, most from Pennsylvania. While the state charges 20-cents a barrel for out-of-staters, at least one private company charges $3/barrel for drilling waste disposal. Clearly, taking drilling waste can be big business – especially when you consider how many truckloads of waste fluids are being hauled away just from the Marcellus gas fields. According to news reports, PA drillers sent almost 1.5 million barrels of waste to Ohio injection wells during the second half of 2011. And the drilling has yet to begin in NY. They are banning injection into Precambrian rock – those formations at 8,000 feet and below. Existing wells that reach into that formation must be plugged. Injection wells must have state-of-the-art pressure and volume monitoring; that includes automatic shut-off systems. The state will require an electronic tracking system to identify chemicals in all drilling waste fluids entering the state. NY Governor Andrew Cuomo insists that science must guide drilling regulations. It’s pretty clear from OH – and other states experiencing injection well-caused quakes – that drilling has out-paced the science. Will Science Determine NY Drilling Policy? And who could be more scientific and less emotional than the US Geological Survey? Dusty Horwitt, Senior Counsel for the Environmental Working Group recently reviewed comments the USGS sent in response to the most recent revised draft Supplemental Generic Environmental Impact Statement (SGEIS) for high-volume horizontal hydraulic fracturing in shales. The plan is flawed, say the federal scientists. And allowing drilling and fracking would endanger water supplies of rural and urban residents. In the SGEIS the NY State Department of Environmental Conservation (DEC) proposes that a 500-foot buffer is sufficient to protect water sources and aquifers. USGS disagrees. A 500-foot buffer around aquifers that supply major municipal water systems may provide only partial protection to these aquifers, they say. Likewise, a 500-foot buffer for private water wells and springs affords only limited protection and doesn’t take local geology, hydrology nor topography into account. Water quality changes can occur at significant distance from a disturbance – especially if a domestic well is located below a well pad – and USGS suggests that in some cases state regulators need to be thinking in terms of miles, not feet. Federal scientists also criticized the SGEIS for under-representing number and extent of natural faults in the region where shale gas drilling would occur. 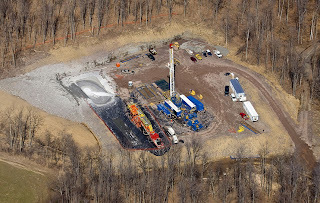 USGS pointed out that drilling and hydraulic fracturing directly beneath faults could potentially allow contaminant to flow upward into underground aquifers. They pointed out that there are generally far more natural faults in bedrock overlying the Marcellus Shale than other places. USGS also criticized what they perceive as a lack of detailed information on underground freshwater sources. The depths of underground drinking water sources are not well documented – these must be established so that drilling companies can design casing and cementing to prevent migration of gas or saltwater into underground drinking water supplies. NY State doesn’t require drilling companies to map underground fresh water and salt water sources before they drill – and that information is critical to the design and installation of effective casing and cementing. You can read more here.